The M2100 Emergency Controller is designed to take care of the complete control of an emergency generator. The M2100 Emergency controller works automatically. It will start and stop the emergency generator according to the “delay” and “return-to-normal” periods which you have choosen. The M2100 is a quality product with focus on reliability and safety. The product includes serveral safety functions in order to protect both the engines and the emergency generators. The SELCO M2100 Emergency Controller has been designed to take care of the complete control of an emergency generator. It controls start and stop of the engine, monitors the engine and the transfer during start and operation, and simultaneously indicates – on the front – all necessary information about the conditions of the emergency generator. The M2100 performs the role of an AMF system (Automatic Mains Failure), as it continuously monitors the main supply for possible disruptions. A programmable start delay prevents unnecessary start ups due to short term power glitches. The M2100 can be programmed to perform multiple start attempts with intermediate rest times. Automatic Mains Failure unit – provides complete control of an emergency diesel generator set. Easy control of load transfer between normal supply and emergency generator. 10 LED’s on front panel indicates all necessary information about the conditions of the emergency generator. 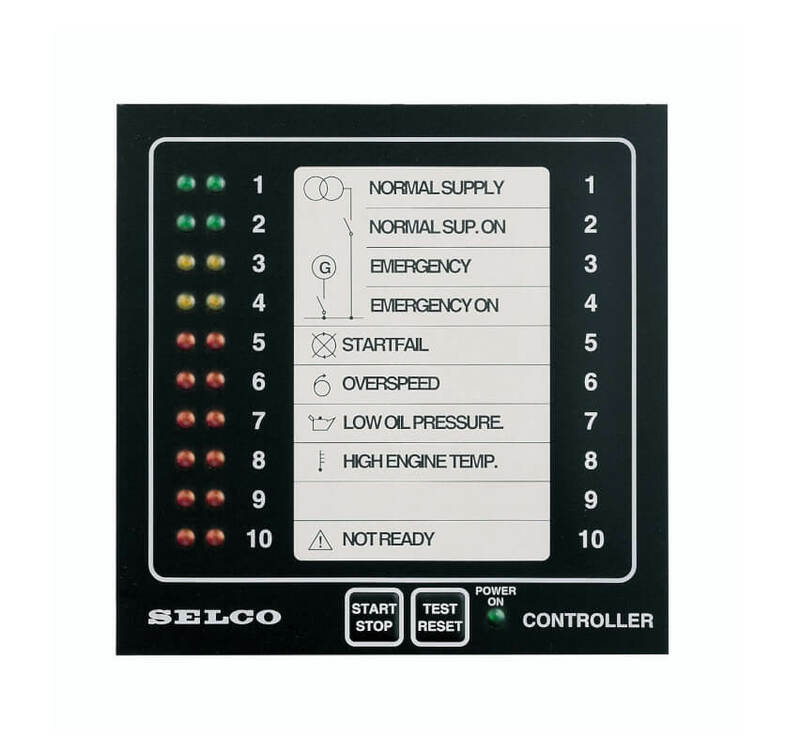 16 inputs for start/stop, crank disconnect, low oil pressure, alarms and other parameters. 11 outputs for connection to external relays and other control equipment. Easy programmable. E.g. start attempts, time sequences, external circuit check etc. programmable via switches. Automatic test and intermittent pre-lubrication. Clear indication if all conditions for emergency supply are present. Compact unit for easy front panel mounting.